Hanscome, Jeanette. 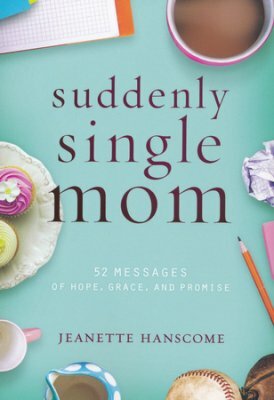 Suddenly Single Mom: 52 Messages Of Hope, Grace, and Promise. Franklin, TN: Worthy Inspired Publishing. 2016. Finding herself alone to raise her children, author Jeanette Hanscome shares 52 timely devotions aimed at providing hope, grace and promise during a difficult time. Through scriptures, prayer, encouragement, considerations, personal stories, and survival tips, Suddenly Single Mom helps at a lonely, painful and challenging point in life. Packaged in a beautiful book with an appealing cover, the messages are uplifting, relevant, meaningful and faith-based. Hard enough to raise children with two parents, doing it alone must be even harder. Therefore, this book would be perfect for those trying, demanding, complicated, and hopeless times when a hug, kind word, grace and friend would make all the difference in the world. Pair those with the love and promises of God and life seems a bit more manageable. Being careful not to speak harshly of her ex-husband, the author has written numerous articles, devotions and books while enjoying her time raising her sons. Perfect as a Mom’s Ministry or Bible study, Suddenly Single Mom is thoughtfully and earnestly written. This entry was posted in Christian Books, Christian Devotional and tagged Christian, Christian Author, Christian Book Review, Christian Contemporary, Christian Non-fiction, Devotional, Divorce, Inspirational, Jeanette Hanscome, Single Mom, Suddenly Single Mom by Savurbks. Bookmark the permalink. Thank you so much for this nice review, and for taking the time to share your thoughts! I really appreciate your support of my book. Your book was well written and done in an uplifting, honorable manner. Thank-you for visiting!